Director Denis Villeneuve's follow-up to Ridley Scott's seminal tech noir opus Blade Runner is a transcendental sequel that brings the cerebral to Hollywood. If you're looking for high-octane action; you would do well to look elsewhere. Villeneuve artfully unpacks the enigmatic core of the original Blade Runner at a languid pace, befitting a transformative museum tour, that respects the source material and audience's intelligence in Blade Runner 2049. Villeneuve presents a central protagonist, Officer K (Ryan Gosling), who embarks on a rerun of Rick Deckard's (Harrison Ford) mission to retire a replicant 30 years later. 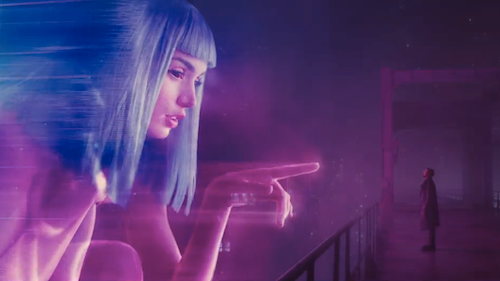 This blade runner is in a romantic relationship with a holographic personal assistant called Joi (Ana de Armas) that recalls Samantha (Scarlett Johansson) in Spike Jonze's Her. Ultimately, K's journey is a Pinocchio parable as explored in Steven Spielberg's A.I. Artificial Intelligence and that's not the only reference to the late Stanley Kubrick as fans will discover. Harrison Ford reprises a fan favourite role a la Star Wars: The Force Awakens. However, all I'll say is that his performance as an aging Deckard is mesmeric and a career high. Robin Wright, Sylvia Hoeks and Jared Leto are all phenomenal. Hoeks bares an uncanny resemblance to Sean Young who played Rachael in the original Blade Runner. Sweeping vistas are wrapped in an industrial soundscape with callbacks to the original score, composed by Vangelis, and Sergei Prokofiev's childhood classic Peter and the Wolf. 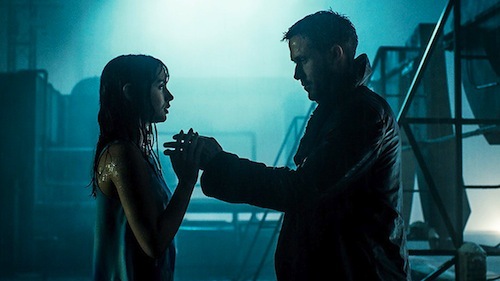 It's a treatise on existentialism in a neon-drenched dystopia and a heartbreaking love story between an android and an app achingly distilled by Ryan Gosling and Ana de Armas. Blade Runner 2049 left me melancholy and, conversely, optimistic by its enchanting end. Amidst the deafening roar of nihilistic blockbusters, there are compelling stories of the human condition being told like in fairytales of old. That's worth tears in the rain.